​Doctor of Optometry degree from New England College of Optometry in Boston, MA in 1993. She opened her first practice in Oakland, CA in 1997 after practicing for several years in NYC. We relocated to our current location in the Old Historic SEARS building in 2003. 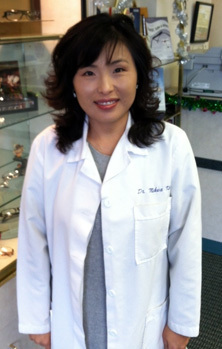 Dr. Kim is licensed and TPA certified by California State Board of Optometry. She can diagnose eye problems and provide treatment for variety of eye diseases. She also work with Glaucoma, Cataract , and Retinal specialists in the Bay Area and provide consultation and co-management for LASIK ( Laser Vision Correction) patients. She is assisted by Sophia and Maria, who has been her staff since 2010. With her extended years of experience, she can kindly help you with most of your eye care needs.